Lack of sanitation has immediate implications on the health and quality of life of women living in environmentally degraded areas. The lack of treated water has a direct impact on health, especially that of younger women and older women, as it increases the incidence of gastrointestinal infections. The lack of sewage collection and treatment services, even when access to treated water is provided, is the cause of another part of gastrointestinal infections and mosquito-borne diseases. The most serious problems occur next to rivers and contaminated streams or in streets where open sewage runs - which runs in ditches and gutters. But pollution of water reservoirs and springs, which have its water quality deteriorating over the years, also affects the health of Brazilian women. This chapter examines the incidence of infectious gastrointestinal infections in Brazilian women, the evolution of these indicators and the severity of gastrointestinal infections - which lead to bed rest, hospitalizations and deaths. Finally, the partial effect of lack of sanitation on the incidence of infectious gastrointestinal infections in women is analyzed. 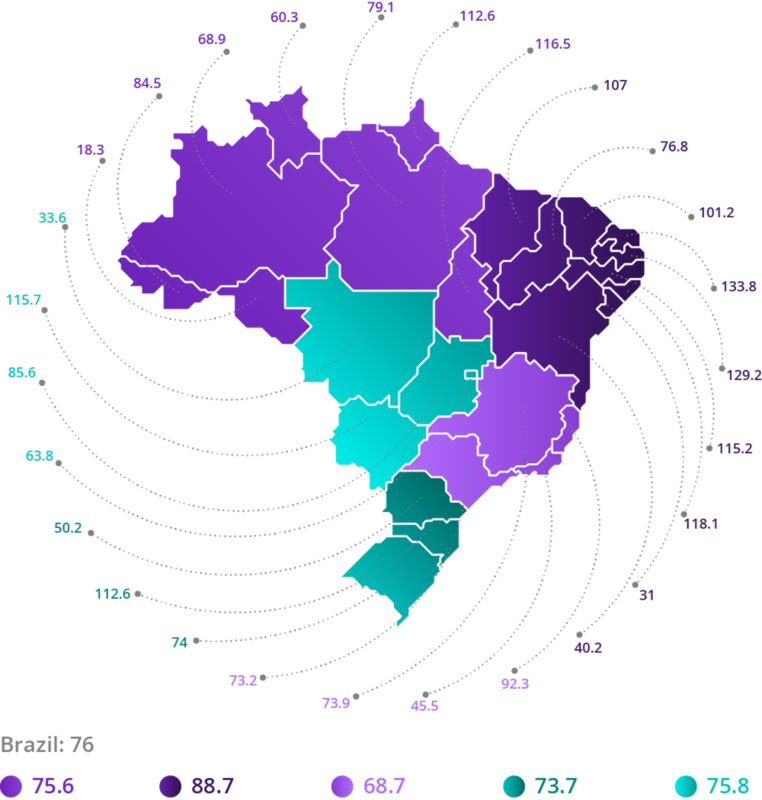 The National Health Survey (PNS) of the Brazilian Institute of Geography and Statistics (IBGE) has produced very detailed information on the health of women in 2013, which makes it possible to compare the health problems that afflicted the Brazilian female population with the socioeconomic characteristics of women. Among the points analyzed, the survey asked a representative sample of men and women if there were any leaves from routine activities in the two weeks prior to the date of the interview, the reason for the absences and for how many days the interviewees were away. Based on this information, it is possible to evaluate the incidence of departures from routine activities due to diarrhea or vomiting in the Brazilian female and male populations. In 2013, according to PNS data, 576,213 people indicated that they had taken a leave from their routine activities due to diarrhea or vomiting (presumed gastrointestinal infections). Of this total, 304,076 were women (or 52.8% of the total) and 272,137 were men (or 47.2% of the total). Based on these data, it is estimated that there were 7,906 million cases of diarrhea or vomiting absences among women throughout the year 2013. (1 It is important to note that the same woman may have withdrawn from her activities for more than one occasion over a year). In 2013, 86.1% of the female population away from their activities due to diarrhea or vomiting lived in urban areas of the country and only 13.9% in rural areas. In the capitals of the Federation units, 2.133 million cases occurred (27.0% of the total) and in the cities of the interior, 5.73 million (73.0% of the total). The regions of the country with the highest numbers of absences among women were the Southeast, with 3.044 million cases (38.5% of the total) and the Northeast, with 2.549 million cases (32.2% of the total). Among the units of the Federation, the largest number of cases occurred in the most populous states: alone, the state of Sao Paulo accounted for 21.1% of the cases of women leaving because of diarrhea or vomiting and Minas Gerais accounted for 10.0% of total cases in the country. Statistics by region, area and capital are presented in Table A.5 of the Statistical Annex. The rate of incidence measures the ratio between the number of cases occurred and the total population, that is, it measures the absences in relative terms. The incidence rate is expressed in cases per thousand inhabitants. In this indicator, there were 76.0 withdrawals per thousand women in the country in 2013. In the average of capitals, the incidence rate was higher: 83.1 cases per thousand women. In regional terms, the highest incidence occurred in the Northeast of the country, with 88.7 cases per thousand women. In the region, the states with the highest incidences of diarrhea and vomiting were Ceara, Rio Grande do Norte, Paraiba, Pernambuco, and Alagoas, all with rates above 100 leaves per thousand women. The North and Midwest regions registered incidence rates higher than 75 cases per thousand women. In the North, the results of Amapa and Tocantins, with a tax incidence of 122.6 and 116.5 cases per thousand women, respectively, were the highest. In the Midwest region, the case of Mato Grosso do Sul stood out, with 115.7 cases per thousand women. It is worth mentioning the relatively poor index of the state of Santa Catarina, which had 112.6 cases per thousand women, a rate 52% higher than Brazil's average. Source: IBGE, 2015. Elaboration: Ex Ante Consultoria Econômica. Absences due to diarrhea or vomiting was concentrated in the younger women. In the age group of up to 14 years old, the incidence of absences from routine activities reached 132.5 cases per thousand women. In the age range between 15 and 29 years, the incidence dropped to 79.1 cases per thousand women. From the age of 30, the incidence rate was between 50 and 55 cases per thousand women. It is worth noting that for almost all age groups, the incidence of diarrhea or vomiting is greater in the female population than in the male population. The greatest difference, both in absolute and relative value, occurred in the age group of people between 15 to 29 years old. As it will be discussed in more detail in the following chapters, in this range there was a large concentration of students and mothers. The incidence of diarrhea or vomiting was extremely high in the female indigenous population. In this group, there were 175.9 cases per thousand women in 2013. The population of multiracial self-reported women also had a high rate: 80.2 cases per thousand women. The rate was relatively lower among black self-reported women, a group in which the incidence was only 48.9 cases per thousand women. In the distribution by level of education, the incidence rate was higher among women without education, a category that registered 92.4 cases per thousand women. The second group with the highest rate was women with incomplete high school education, with 82.7 cases per thousand people. It is worth noting that the incidence of diarrhea or vomiting was also high among women who completed college. In this group there were 75.3 cases per thousand women in 2013. Of the total of 7.906 million cases of absences due to diarrhea or vomiting among Brazilian women, those living in households in the first quintile of household income distribution per capita accounted for 2.195 million cases, or 27.8% of the total of cases. 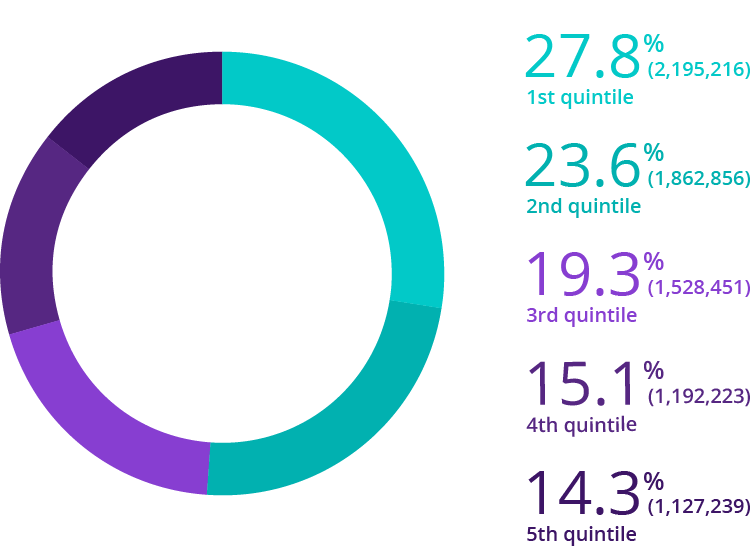 In the second quintile, there were 1.863 million cases, or 23.6% of the total. In relative terms, it is worth mentioning that the incidence rate was higher in the third quintile, where there were 83.1 cases per thousand women. This is explained by the fact that in this class of household income there is a high proportion of elderly women (retired or pensioners) or who work in the labor market. According to the National Health Survey (PNS) of IBGE, in the 7.906 million cases of women on leave due to diarrhea or vomiting during the course of 2013, women were away from their activities for 3.48 days on average. This implied the occurrence of 27,506 million days of absences from routine activities over a year. If they had not contracted gastrointestinal infections, these women could work, study, or simply rest during the time they became ill. Compared to the male population, it is worth mentioning that the average number of days of absence of women due to diarrhea or vomiting was higher. In the group of men, departures for this reason lasted 3.15 days on average. Thus, the female population accounted for 55.3% of the total days of leave and the male population, for only 44.7%. Of the women who stepped away from their routine activities due to diarrhea or vomiting, 3.608 million were bedridden for at least one day during their leave. This means that in 45.6% of the cases of withdrawal the infections were severe enough to require bed rest. In this statistic of infection severity, the male indices were also smaller: only 40.7% of the men who had withdrawn from their routine activities due to diarrhea or vomiting became bedridden. The incidence rate of women bedridden due to diarrhea or vomiting was 34.7 per thousand people. In rural areas, the incidence rate was higher (44.8 per thousand women) and in urban areas, the lowest (33.1%). Table A.6 of the Statistical Annex shows the statistics per unit of the Federation, areas and regions. The incidence of women in bed due to diarrhea or vomiting was relatively higher in the Northeast and North regions of the country: respectively 47.8 and 40.0 cases per thousand women. The lowest incidence was in the Southeast and South regions of Brazil, which recorded rates of respectively 23.2 and 38.5 cases per thousand women. In the case of the Southern region, statistics from the state of Santa Catarina again draw attention: the incidence of women in bed was 77.8 per thousand people, a rate 109.4% higher than the average of the region itself. The highest frequency of cases of diarrhea or vomiting occurred among women up to 14 years of age (33.2% of total cases). 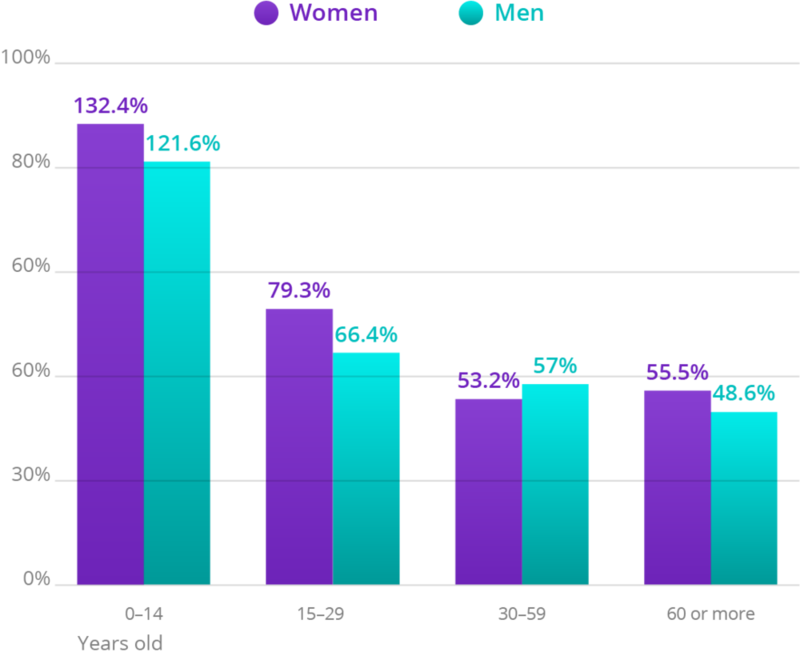 Young women, aged 15-29 years old, accounted for 23.8%, those aged between 30 and 59 years old, for 31.0% of the cases, and women over 60 years old, for 12.1%. Although they have a smaller participation, it is worth mentioning that the proportion of women who are absent from their activities due to diarrhea or vomiting and have been bedridden is very high: the proportion was almost 9 out of 10 women in the year 2013. Source: DATASUS and IBGE, 2015. Elaboration: Ex Ante Consultoria Econômica. According to data from the Unified Health System database (DATASUS), there were 353,503 hospitalizations due to infectious gastrointestinal diseases in SUS network hospitals in 2013. Of the total number of hospitalized patients, 187,308 (53.0% of the total) were women and 166,195 were men (47.0% of the total). Table A.7 of the Statistical Annex shows the number of women hospitalized for infectious gastrointestinal diseases in the hospitals of the SUS network in 2013, per unit of the Federation, area and capital, which allows comparisons with the statistics of absences and of women who were bedridden. Table A.8 of the Statistical Annex brings the same hospitalization information, but for 2016. Statistics show an incidence of 1,801 admissions per thousand women in 2013, a figure higher than that of the male population (1,721 per thousand men). For all age groups, with the exception of the younger age groups (up to 14 years of age), hospitalization rates were higher among women. The data show that the women were on average 3 days hospitalized, indicating a total of 563.2 days of hospitalization in SUS network hospitals in 2013. Also according to DATASUS statistics, 4,809 deaths were recorded due to gastrointestinal infections in the country in 2013. Of this total, 2,614 deaths were among women (54.4% of the total). The majority of these deaths occurred in the older population, despite the fact that these diseases were more frequent in the young: 73.7% of the deaths were in women over 60 years of age, while 15.2% of the deaths were in girls who were up to 14 years of age. The mortality rate due to infectious gastrointestinal diseases was higher among women than among men. In 2013, 2.5 women died for this reason in every 100 thousand people. In the male population, the mortality rate was 2.3 people per 100,000 men. Considering the age groups, the highest proportion of deaths occurred in the female population over 60 years of age: 12.9 persons per 100,000 women. Mortality among young women was also high in comparison to the average: 1.9 deaths per 100,000 girls up to 14 years of age. The mortality rate was particularly high in the Northeast and North regions, with incidence of 3.9 and 2.8 deaths per 100,000 women. In the North of the country, the highest rates were observed in Amazonas and Roraima: 4.9 and 5.5 deaths per 100,000 women. In the Northeast, the states with the highest incidences of deaths due to infectious gastrointestinal diseases were Alagoas (7.0 deaths per 100,000 women) and Pernambuco (5.5 deaths per 100,000 women). The adverse consequences of lack of sanitation on the health of the population are severe, but the advancement of the distribution of treated water and the collection and treatment of sewage bring visible results. According to data from the 2003 National Household Sample Survey, 20.1 million women did not have access to the general water distribution network, equivalent to 22.1% of the country's female population. At the time, 49.4 million women had no access to sewage collection in their homes, almost 55% of the Brazilian female population. By 2016, the number of Brazilians without access to treated water had fallen to 17.2 million, which indicated a relative water deficit of 16.3% of the female population. In relative terms, the drop in the number of Brazilians without access to sewage collection services was higher, from 15.5 percentage points, from 54.4% in 2003 to 38.9% in 2016. 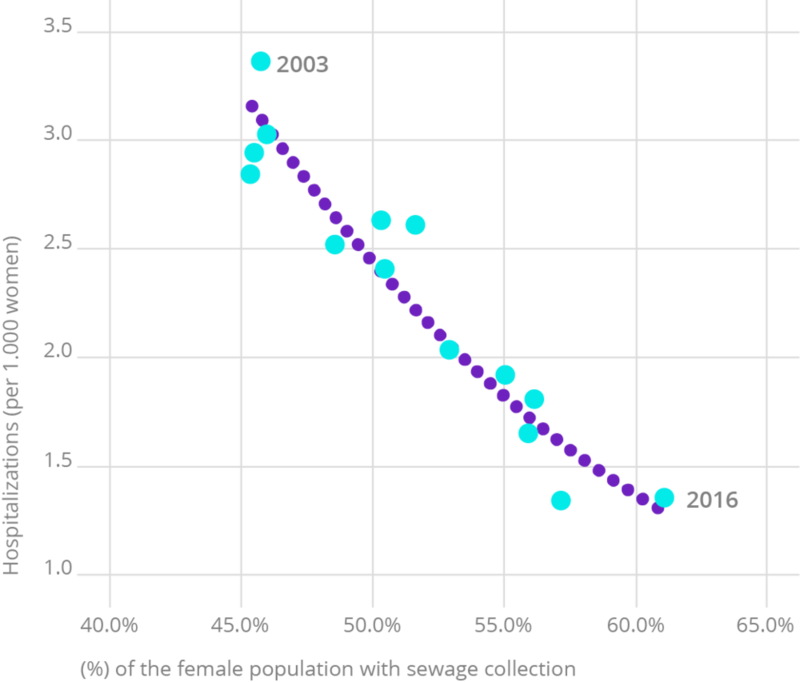 This means that, despite the strong population growth observed in the period, the number of Brazilians without adequate sewage collection in 2016 (41.2 million women) was lower than in 2003. Source: DATASUS. Elaboration: Ex Ante Consultoria Econômica. 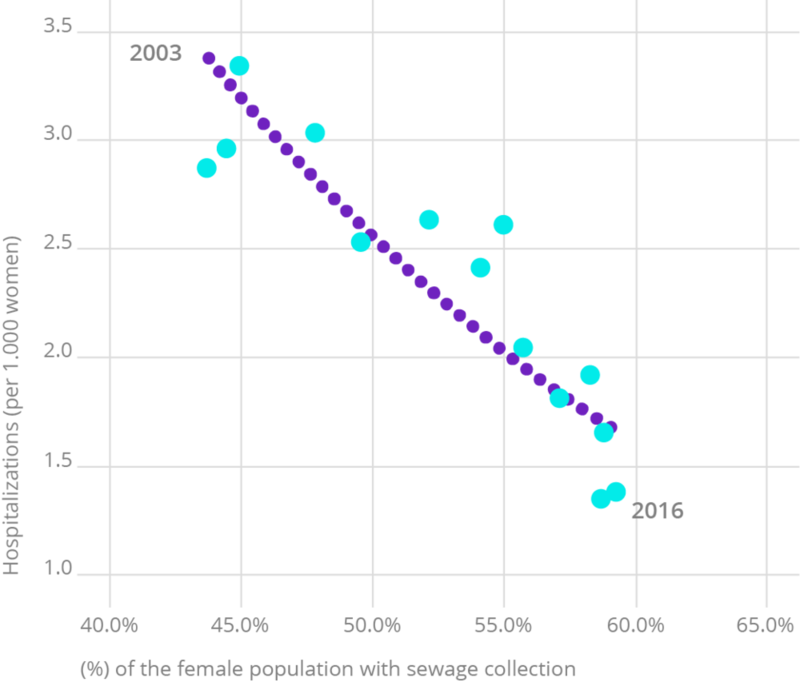 Graph 3.10 shows, for the female population, the evolution of the sewage collection coverage in the country and the incidence of gastrointestinal infections that resulted in hospitalization in the SUS between 2003 and 2016. Each year, with an increase in the share of the female population served by the sewage collection system, the hospitalization rate (hospitalized per thousand women) fell systematically. Graph 3.11 shows the expansion of the population with access to treated water and the systematic reduction of the incidence rate of gastrointestinal infections. Source: IBGE, several years and DATASUS (*) Female population hospitalized in SUS hospitals for ICD 10: Cholera, shigellosis, amebiasis, diarrhea and presumed infectious gastroenteritis, other infectious intestinal diseases. Elaboration: Ex Ante Consultoria Econômica. Data from the National Health Survey of 2013 (IBGE, 2015), which details a wide range of information on Brazilian women, corroborate the negative relationship between access to sanitation and the absence from daily activities due to diarrhea or vomiting. It was found that the probability of occurrence of withdrawal from daily activities due to diarrhea or vomiting was negatively correlated with access to sewage and treated water services. The greater the access to these services, the lower the probability of absence due to gastrointestinal disease. It is worth mentioning that the regression analysis also identified that the probability of withdrawal due to infectious gastrointestinal disease is significantly lower among men than among women - see details in the Methodological Annex.